Doubling down against the torrent of health-conscious eating, Astro Doughnuts proudly and deliciously claimed their June 26 Washington Post mantle of maing the best doughnuts in D.C.
Now that bathing suit season is (finally) ending, we're ready to eat up. Located near Metro Center, a block from Macy’s on G Street, Astro Doughnuts & Fried Chicken (1308 G St. NW) would be easy to miss except for the steady stream of customers going in and out of the tiny storefront. The soothing smell of fried goodness wafted through my nostrils the moment I opened the front door. Serving a staple rotation of maple bacon, peanut butter and jelly, crème brulee doughnuts, Astro Doughnuts allows Chef Jason Gehring creative leeway in coming up with unique flavors, so-called “wild card” doughnuts, which join the everyday staples. Made fresh daily in a kitchen below the store level, a dumbwaiter brings the doughnuts up as they are made. A single stand hosts the daily assortment. “Our most popular doughnut is crème brulee,” Elliott said. Even against the peanut-butter-and-jelly one? “So much better than crème brulee?” I teasingly taunt. No comment. Smart man. Adding a unique twist is the fried chicken element. Buttermilk fried chicken are glazed with sriracha sauce, and while I didn’t try a standalone fried chicken order -- they were sold out -- I did try the Astro Doughnut BLT sandwich. Bacon, chives, cheddar, fried chicken, lettuce and tomato, drizzled with sriracha mayo, are plopped on a doughnut. I’m not sure the First Lady, or along that vein, my mother, would approve of these heart-pounding ingredients but my tastebuds certainly did. The donut wasn’t too soft or too sweet -- just hearty and tasty enough to add a balancing punch to the fried chicken and sriracha mayo. In fact, I could have probably used more sriracha! But whether you desire savory or sweet, I definitely recommend Astro Doughnuts. 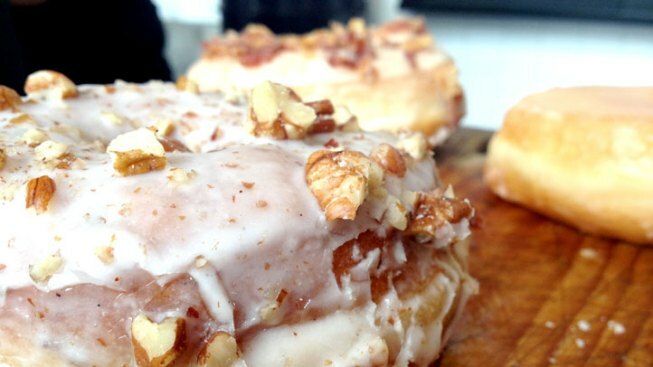 Well deserving of the title of best doughnuts in D.C. Hours: Mon.-Fri., 7:30 a.m.-6 p.m.